Natchez Lodging at the J N Stone House Musicale Bed and Breakfast. Only at this unique bed and breakfast in Natchez Mississippi can you enjoy sipping complimentary wine while relaxing to classical piano music of the Masters, played on this 1903 Steinway grand piano in the Music Room. The Steinway is a six-foot, three-inch Model A with ivory keys, built in New York. The first owner was the prominent newspaper publishing Blauvelt family of New Jersey. Rebuilt in 1996 by Kalman Detrich and Steinway in New York, March 11, 2003 was this instrument's 100th birthday. 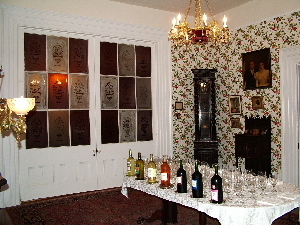 The large fenestrated pocket doors behind the piano, stunningly ornamented with stained and etched glasswork, open to the Dining Room where wine receptions are held. Antique evening gown of black silk, heavily ornamented with tiny faceted jet beads interwoven in lace, owned by ancestor Miss Alice Jenkins of Elgin Plantation, Natchez MS, who spent lavishly on her clothes. Generously donated to Stone House in 2008 by Polly A. Stone, who inherited it in 1997. The gown now enhances the Music Room at this bed and breakfast in Natchez MS which includes a classical music program for the guests. 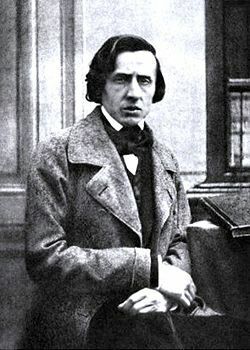 Frédéric Chopin (1810-1849). Ref: Wikipedia. 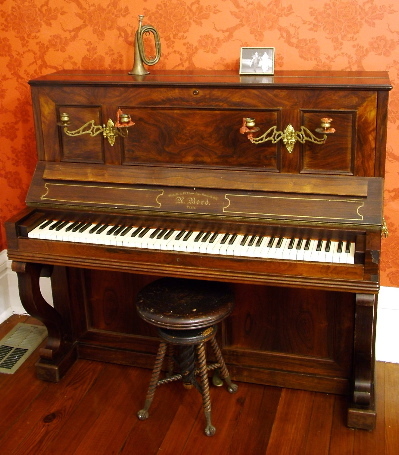 The venue for this entertainment in Natchez Mississippi is enhanced by this rosewood piano with ivory keys, brass sconces and inlay by Antoine Bord, Paris 1856. Bord's instruments were built for him by the Pleyel factory. 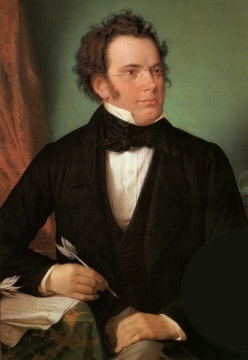 Franz Schubert (1797-1828). Ref: Wikipedia. ** The concert is not guaranteed for late arrivals or last minute bookings. 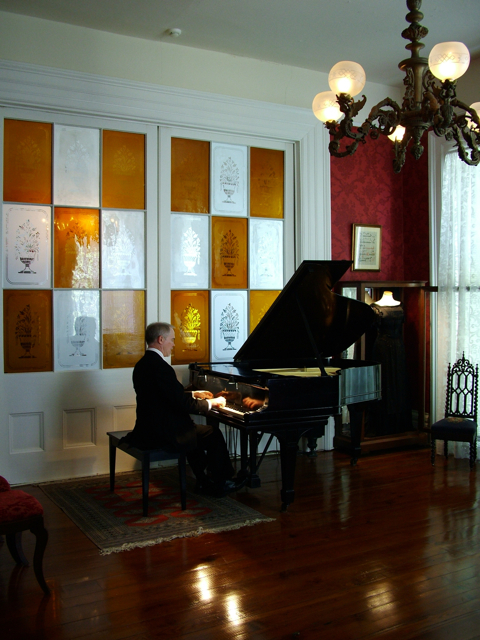 Enjoy a private classical piano performance** by Joseph Stone, a graduate of two prominent American conservatories, along with complimentary wine or other beverage, at this unique music program in Natchez MS.
Louis Moreau Gottschalk (1829-1869), New Orleans composer of Pasquinade. Ref: Wikipedia. Joseph Stone holds a Bachelor of Music and a Performer’s Certificate from the Eastman School of Music in Rochester, New York; and a Master of Music from the Manhattan School of Music in New York City, both degrees in clarinet performance. He first studied piano music in Natchez MS in childhood, and later switched to the clarinet before entering conservatory. Classical piano also was studied privately for the Bachelor’s degree at the Eastman School. A professional clarinetist for over 20 years, his extensive musical career featured solo performances of Claude Debussy's Première Rhapsodie for Clarinet and Orchestra with the Rochester Philharmonic in the Eastman Theatre, and the Mozart Concerto for Clarinet and Orchestra in New York City's Alice Tully Hall and at Fordham University's Rose Hill Campus. His chamber music appearances in New York at Carnegie (Weill) Recital Hall and Merkin Concert Hall, and at the Library of Congress and the Organization of American States in Washington, D.C. among others, presented premiere performances of works by composers such as Karel Husa, Heitor Villa-Lobos, Jacob Druckman, George Perle, John Cage and Roberto Sierra, garnering enthusiastic praise from critics in The New York Times, The Village Voice, and The Washington Post; other performances on tours across the United States, in Canada and Puerto Rico received excellent reviews locally. Chamber music residencies were served at New York's Hunter College and the Americas Society/Center for Inter-American Relations. Orchestral appearances as principal clarinetist include a Carnegie Hall performance of Alberto Ginastera's Variaciones Concertantes, the North American premiere of Rossini's Elisabetta, Regina d'Inghilterra, the Wagner Society Festival at Princeton University, orchestral concerts with solo pianists Andre Watts and Marianne McPartland, and many years with The New York Gilbert and Sullivan Players and Opera Northeast. Since 1997 Joseph has played only piano, and in summer 2006 he returned to Rochester for piano studies with Howard Spindler, Chair, Piano Department, Eastman Community Music School. Since launching this piano concert series at Stone House in 2006, Joseph has performed piano recitals for over 75 group tours booked by 30 different tour operators. Some of the elite groups for which he has performed at the Stone House include Trafalgar, American Cruise Lines - Queen of the Mississippi, Histoire Voyages, Nomads Travel of Detroit, Walter Anderson Museum of Art, Silver Bay Tours of California, Tauck Tours of Memphis, Ken Ward Travel of Atlanta, Lighthouse Tours, Elderhostel, Globe Treks, Exploritas, and Road Scholars, as well as for the Rector of Voronezh University, Russia and his entourage. Additionally, since 2003 more than 600 piano performances have been presented for Stone House Bed and Breakfast guests and other individual tourists visiting Natchez. He has played fundraisers for the Natchez Festival of Music both at Holly Hedges and at the Stone House. In 2011 he appeared as pianist at the Mississippi Museum of Art in Jackson, MS as the entertainer for 'Natchez Day', a day celebrating arts in Natchez which was the culmination of a week-long exhibit dedicated to Natchez artists. Joseph's latest out of town appearance was September 22, 2012 at the Renwick Gallery, Smithsonian Institution in Washington, DC, where he played a classical piano introduction to the catwalk fashion show featuring Prophetik Designs by Jeff Garner. Since 2011 this program has been rated by TripAdvisor as the Number One entertainment in Natchez Mississippi. Johannes Brahms (1833-1897). Ref: Wikipedia. 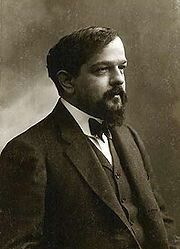 Claude Debussy (1862-1918). Ref: Wikipedia. The music program and wine are complimentary with Natchez lodging at Stone House B&B. It is also available to group tours, including the concert, house tour and wine reception.